Hollywood is oozing with talent and creativity. Home to trendsetters and celebrities who have the vision to create their own mark in the industry, it's no surprise that rebellious wedding ideas crop up here and there. Take inspiration from some of the brilliant ideas invented by Tinseltown's greatest. Rebellious Bride Gwen Stefani and Gavin Rossdale had a traditional wedding last 2002 in London attended by their closest family and friends. But this didn't stop the bride from making sure her personality would shine through. She wore a rebellious customized John Galliano pink Dior gown that set a lot of trends all over the world to last us a lifetime--and considering this was in 2002, she was definitely as always, ahead of her time. But apart from this major rebellious detail known about Gwen & Gavin's wedding, there were also other unique simple details included in the wedding such as using double decker buses to shuttle guests to the reception, and two weeks after the wedding there was immediately a vow renewal wedding in LA (Los Angeles) attended by their celeb friends, and on their first year anniversary, they quietly visited the church where they got married, reenacting the wedding with their bridal car. 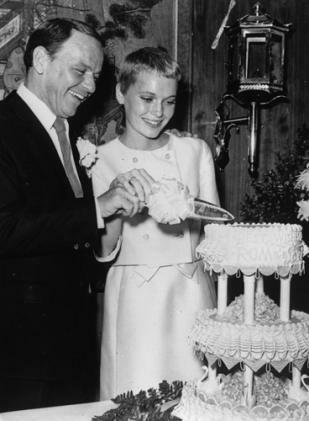 Rebellious Bride Mia Farrow's Vegas wedding to Frank Sinatra is still included as one of Vegas' craziest weddings in history. Mia caused a media frenzy when she wed 50-year old Sinatra when she was 21. And considering the year they got married (1966), people were not only shocked by the age difference but even on her choice of bridal look when she walked down the aisle in a sharp but shapeless shift dress, flat pumps, and of course her signature rebellious hairstyle. Rebellious Bride Sarah Jessica Parker REGRETS wearing a black wedding gown when she married Matthew Broderick secretly in 1997. With all the beautiful Vera Wang black gowns in 2012, I wonder if she still regrets it now? She swears that when the time comes she will wear a "proper white bridal gown" -- but really, Carrie Bradshaw will probably think otherwise. Rebellious Bride Estee Stanley, celebrity stylist, costume designer, and makeup artist had a dilemma. How can she make her wedding HER day when she's got a star-studded, A-list celebrity guest list? Well, she literally asked them to wear masks to avoid the paparazzi. After all, a bride's gotta do what a bride's gotta do. With the Olsen Twins, Justin Timberlake, Goldie Hawn, Tobbey Maquire, et al as your guests, you do need to kinda make sure you are the one to shine! Rebellious Bride Celine Dion sure loves her head pieces and glitz! And who are we to judge? Celine married Rene Angelil in 1994 donning a massive seven-pound tiara that had to be sewn into her hair for support. When she renewed her vows, she channeled medieval golden goddess perfectly apt for her Vegas Cesar's Palace wedding. A lot of people gave her a hard time though. One such nasty comment from a celebrity blog wote: "That headpiece is ugly. Didn't she look in the mirror"? HELLO? Walang basagan ng trip! Let these ideas serve as inspiration for you! But always remember to make things personal and unique to your own character as a couple. What these celebs have done are nothing short of courageous knowing that they are watched by the world in a magnifying glass--what you take with you is their confidence, strength, and innovation. What you bring to the table will be your own. Got other favorite rebellious ideas from other celebs? Share it with us!